ELK Studio has been crazy busy, but I wouldn’t have it any other way! 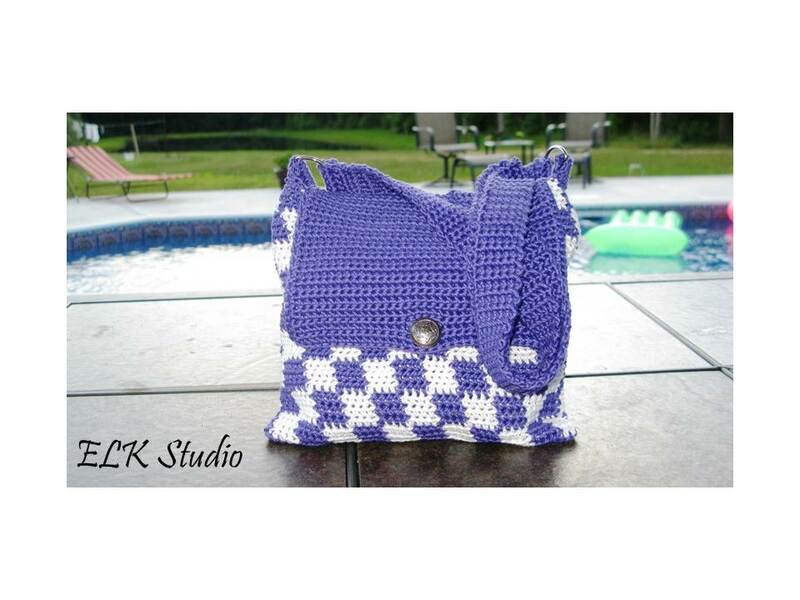 I love having a crochet hook in my hands and creating something that makes me smile. 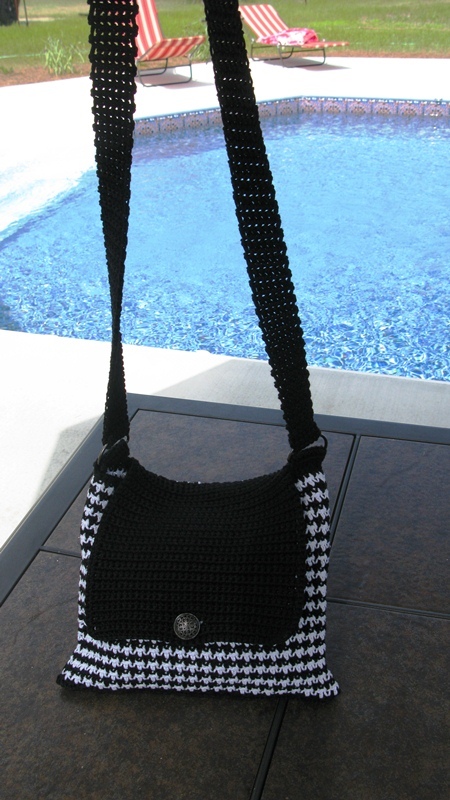 I started working on this Hounds Tooth tote a couple of months ago and the pattern is now ready! I used Sinfonia cotton yarn because it’s hot outside and this has been my go to yarn all summer. I really love the feel of the yarn and it has a “sheen” to it that I think gives the project a quality look. You can find a select few colors of this yarn from Hobby Lobby (definitely the black and white), but I love ordering from Creative Yarn Source. I haven’t tried this project using a different yarn, but I’m sure it would work out fine with any other sport weight yarn. 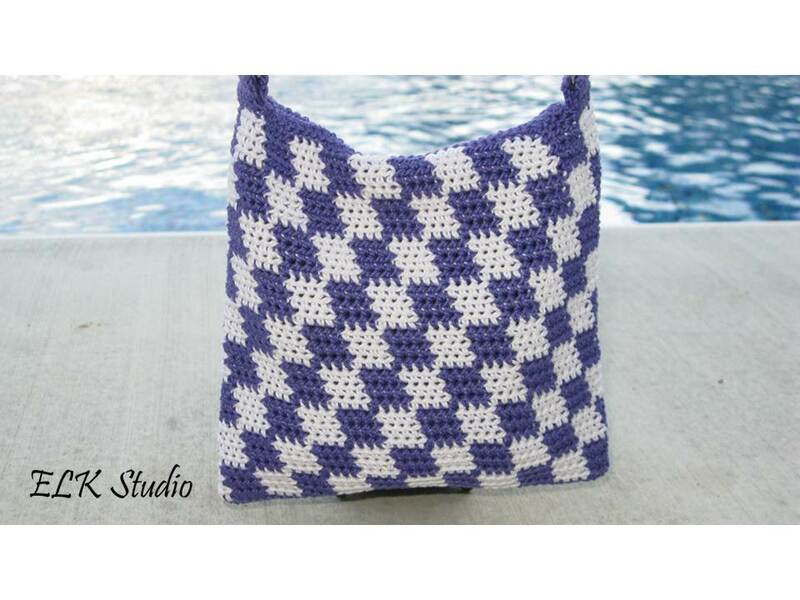 The tote is so much fun to make and works up nicely. The end project measured approximately 10 inches in length and 9-9 1/2 inches wide. The strap length is more of a personal preference and can be different for each person. I made one for someone that wanted to wear it across her body, so it needed to be longer. Let me know if you need any help, and I hope you enjoy the pattern! 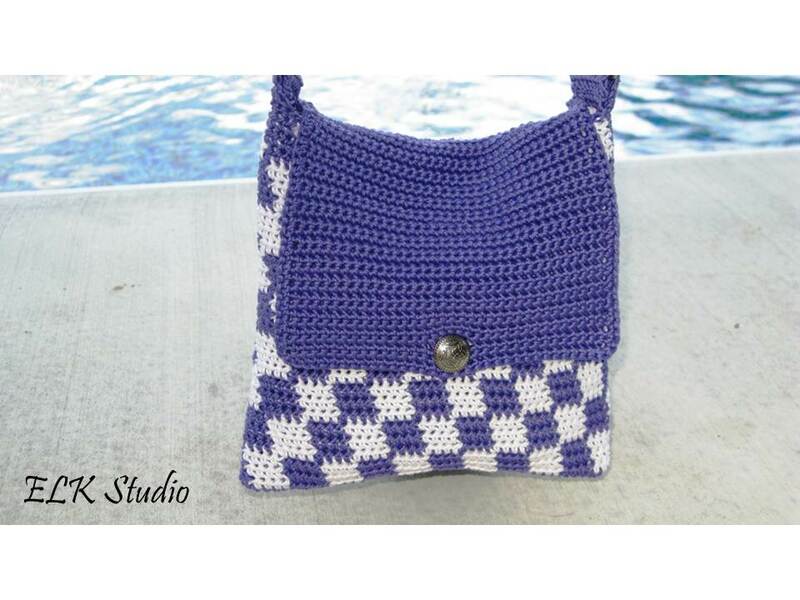 Watch the houndstooth tutorial for more help! Gauge: 10 stitches and 8 Rows = approximately 2 inches. I carried the unused portion along with me and did not cut the yarn at the end of a round. 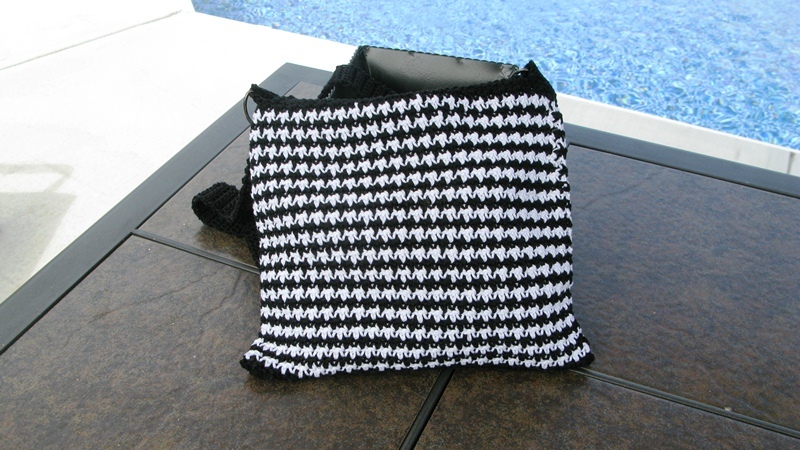 I demonstrate how to carry along with yarn on my Hounds Tooth Scarf pattern. 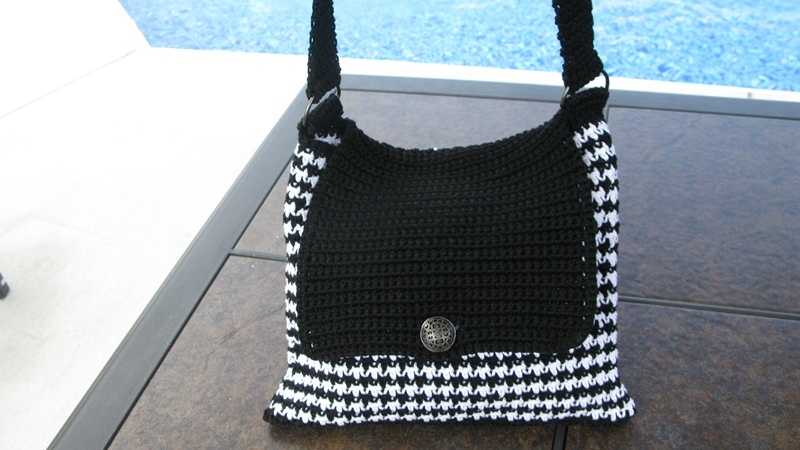 You can choose to cut the yarn but the integrity of the purse would be lessened and not to mention all the ends of weaving you would have to take care of! Ch 1 does not count as a stitch throughout this pattern. Round 1: Continue using the black yarn and join with sl st in first sc, ch 1 sc in same st and in each ch around, sl st to first sc. (88 st) Make sure you chain is straight when joining!!! Count 4 sc to the right (to the left if you are left-handed) of your join and begin the joiner strap here. Repeat Row 2 an additional 5 rows. You will have a total of 7 rows. Fasten off leaving a long tail for stitching your joiner strap together. Place the D ring and sew the joiner strap together using tapestry needle. You will now make the flap for your purse. There should be a total of 36 stitches in between each joiner strap. Below are some suggested numbers of rows, but you can adjust according to your liking. Row 1: Skip 1 st and join with ch 1 and sc in same st and next 33 sc. ch 1, turn (34 st). (Yes, you will have one empty stitch on each side of the purse flap). Repeat Row 2 for 26 rows. Repeat Row 28 once. Finish off. Remember I left 1 stitch open between your joiner and purse flap? Ch 1 and sc in that st and then sc around the outer edging of the flap evenly until you reach the corner then sc twice and then continue sc until reaching the next corner and sc twice and then continue sc evenly until you reach the edge and sc and sl st in the remaining one stitch between the flap and joiner strap. 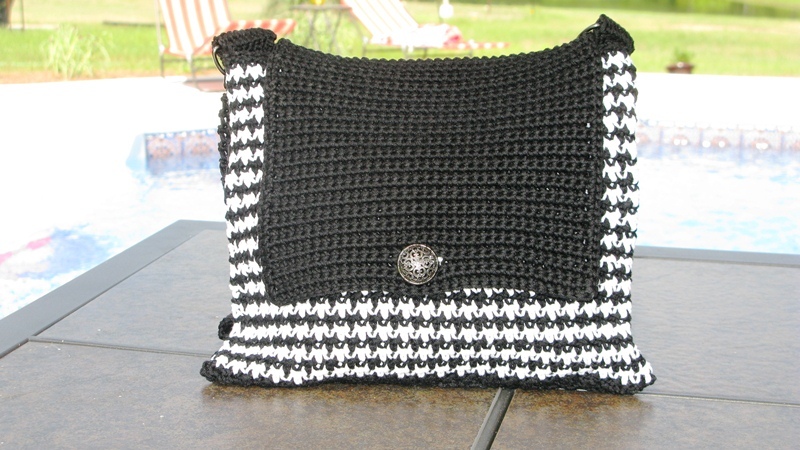 Turn the bag inside out and using a long strand of the black yarn, whip stitch the bottom portion of the bag closed using tapestry needle. Repeat row 2 until reached the desired length. Fasten off. Join the strap to the D rings using tapestry needle. Add a button using tapestry needle. If you are on Ravelry, why not favorite or queue the pattern for easy access? Please feel free to make or sell products from this pattern! I believe in free enterprise but just ask to link back to my site. Please do not re-publish photos as your own.